Once again I've just been zooming through books and I haven't always felt like writing up a full review for them. So here are my litle "blurbs" on some of the books I have been reading. Even though I'm "harsh" and brash and opinionated and lots of negative things, I still really care a great deal about how I am perceived and about my reputation. HONOR is a big deal to me. I don't really care if people LIKE me. I just care that they treat my name well and deal with me in a truthful manner. (Sometimes I don't like them so I consider us even.) But still, that leaves me in a position where I have to be false to truth, craving a mirage instead of being a genuine follower of Christ who cares more about His opinion of me than of others. For more thoughts on this book, see what Challies had to say. I'll just add my recommendation to his. I read A Wife After God's Own Heart almost a month back and then just never sat down and wrote up a "review" detailing my thoughts. Really, all I wanted to do was to detail my thoughts. I've talked about how much I enjoy Elizabeth George before so there's nothing new for me to say about her style of talking to her reader. I still appreciate her approach to sharing wisdom with women. That's really what she does with this book - she shares the wisdom she has gained after nearly 40 years of marriage to her husband, Jim. Now, when someone has been married for almost 40 years, I will definitely sit up and have a listen to what it is they have to say! 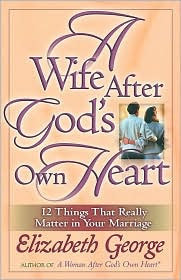 This book, as Mrs. George's others do, gives a lot of practical advice mixed in with the encouragement you need to know that you too can be a success as a Christian wife. She addresses issues such as finances, communication styles, parenting and how to make time for fun in your marriage. I particularly honed in on that aspect of the book because I had grown a little rusty at trying to make ANYthing fun. As a mother of a toddler (with one on the way via adoption) and family things exploding left and right, having fun wasn't at the top of my priority list. Post reading this book, I tried to find ways to relax my mind, so as to relax our home, so as to just plain relax! We aren't all the way there yet, but we're working on it! Whether or not you agree on all of Wilkins' conclusions regarding friendships and relationships, I think Face to Face is an extremely worthwhile read in a day and age where "anything goes" and it is expected of every person to make friends with every other person. Sometimes that's not wise and sometimes that's not safe. Yes, it's important to be FRIENDLY but we so often confuse that with friendships and I appreciate the way Wilkins defines the two a little clearer and provides ample food for thought. At the very leat I would hope we can agree that friendships aren't given much thought and Wikins shifts the spotlight back on them again, to motivate us towards relationships that are beneficial towards us both indvidually and coporately. I like you. Oh, you don't care? I respect you too. Ha! I was a bit surprised too at the results of your quiz, and think that while I don't think I'm as much of a "people pleaser" as many are (I do what I want) -- I do seek approval. Hmmm. 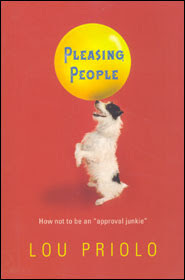 That People Pleaser book sounds like one I NEED!!! Thanks for the review, Carrie! I think I need to read all of these books!